Morning: The day started with a concern for the big swells forecasted. Should I take some motion sickness pills? I decided to wait and see as I got out to the harbor because I do not like the feeling from these pills. When I got there, it did not matter the harbor alongside Long Beach's Shoreline Village was as flat as lake. This began what was a beautiful, successful day of sand dab fishing of the So. Californian coast. This was only my second time out for sand dabs. My last trip was aboard the Sea Angler out of 22nd St. Landing in San Pedro. This time I went aboard the Pierpoint out of Pierpoint Landing. These are the only two landings that target these fish. Soon more landings may join the fun with the scheduled closing of rock cod fishing in the first few months of 2001. From either of these landings the sand dab fishing grounds will take about an hour. The ocean was flat even as we started to leave in the late afternoon. The Pierpoint trip had all the conditions for success. Smaller crowds, everyone using heavier sinkers and best of all there were no currents or mackerel encountered. There were some swells through out the day but it is currents that can cause tangles and not swells. Swells are just water displacements on the surface of the ocean usually caused by storms. Currents are movements of water throughout the depths and can cause several lines to gather at one place and tangle. On the Pierpoint the fear of mackerels diminished when none showed up and the sand dabs started biting. I got three on my first cast and was quite pleased. I dip my cut squid in Baitmate fish scent in the blue color. I found out from the last trip that this scent attracts bigger sand dabs. My classmate, David got the idea when he bought a bottle at Big 5's after Thanksgiving Sale. I did not give it much thought but was willing to try it because I remembered Anise fish scent attracted Johnny Bass over at Santa Barbara Island. More large sand dabs seem to be caught when this scent is used. Some sussequent casts resulted in empty hooks - all the bait gone. I was a bit shocked. So I asked David who had fewer empty hooks on how he had hooked his bait. He double hooked the squid and thereafter, I confirmed that double hooking (re-hooking the squid again pushing the hook through the squid once) increased the hook up percentages. Single hooking the squid may save time but these little fishes can snake a single hooked squid piece right off. I got no more empty gangnions after double hooking the squid pieces. On a drop, my line was bombarded by the sand dab bites. Then the line got heavier and heavier until the flurry of bites stopped and only tiny twitches of the line remained. So I decided to reel up guessing that my hooks either had a fish or no bait. The gangnion came up with seven dabs (my most is eight). 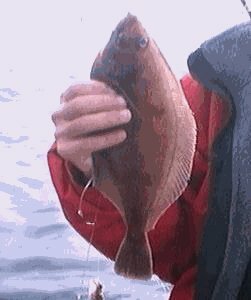 This is the biggest if not the only thrill of fishing sand dabs - to see how many dabs you can catch per cast. Some of you may think I broke the no more than three hook regulation but there are no regulations concerning sand dabs whatsoever, according to Captain at 22nd St. Landing. 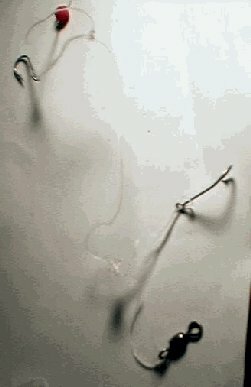 One can use as many hooks as one can handle. Afternoon: All through out the day it went pretty much like this with several sand dabs filling up the gunny sack each hour and I ended up with 54 of them which was better than 21 previously [on a later trip I even did better with 67 ]. More sand dabs than these four on a gangnion happens often. Despite what this picture shows the angler actually had 9 sand dabs on. The rest could not fit into the camera's scope. Fishing for sand dabs is not an adrenaline thing. It's not like you have to get your fly-lined sardine right on that boil before they're gone. It's sort of like going to a Starbucks' CoffeeHouse, sitting down with you friend(s) over a cup of coffee and see what comes up in the conversations. It's also like putting your fishing line into a well full of small tasty fishes and just bringing them up when it's time. Simply put it's fishing you do with a drink in one hand, sort of speak. from 190 to over 290 feet. So try to get the most out of every cast, else you will be very tired at the end of the day with very little fish to show for. Much time is wasted in between actual fishing: you lose time by reeling up, by removing fish caught, by re-baiting hooks, and by casting back down to the bottom. 2) Cue number two has to do with the weight of the gangnion. As you are hit with several bites and you have been setting the hook, the weight of the line should be getting heavier and heavier. A heavy load means you have fish on. Try to record in your kinetic sense the weight of the load when you had 9 dabs on vs. 1-3 dabs. The weight of the load should give you an idea on how much fish you have on and how soon you are to reeling them up. Use the two cues combined and you will get an idea or a feel for when to reel up in order to get the most out of every cast. The thinking for sand dab gear is generally the lighter the better due to the frequent, repetitive reeling involved. 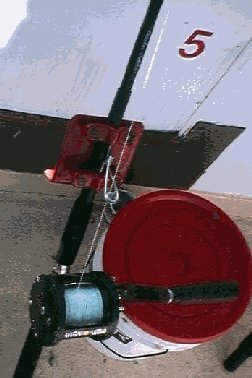 I see people using all kinds of reels; Shimano TLD's, Penn Jigmasters, large Calcuttas, Tiagras, Sealine 50H's, Penn 3/0's, large spinning reels, etc. The reel size generally ranged from a Penn Long Beach to Penn 6/0 Senators. I prefer using anything that will not break your knuckles after a day of fishing. My first trip's Jigmaster ringed my knuckles. It's not really the size of the reel because these fish even with 10 on do not weigh more than 5 lbs. What matters is the reel handle size: the smaller reel handles will painfully tweak the knuckles. I had no problems using a Daiwa 910 Rockcod Special Sealine reel with it's special handle. A Penn 4/0 with a 6/0 handle is good enough. 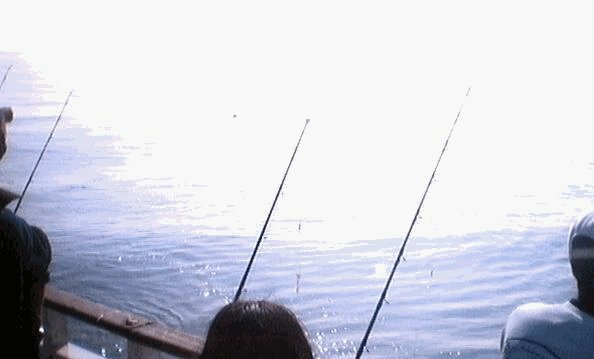 A sensitive-tipped rod is recommended since these fish are small biters. A Daiwa 910 Rockcod Special Sealine Reel fitted on a Calstar Codstick. Notice the big handle. The type of gangnion really did not matter: anglers using beads did just as well as any other types, including anglers using shrimp flies. It's not so important the style but how close you have the hooks together. I suggest you place your hooks very close to one another at no more, no less than 3 inches apart. This closeness allows you to pack more hooks onto one gangnion. The gangnion can only go a certain length before they become too long to handle and a tangling nuisance. Remember there are no regulations regarding how many hooks you can use to fish for sand dabs. The anglers using several hooks caught more than others did with fewer hooks. The shorter the gangnion and the more the hooks, the better. The loops for the hooks are just dropper loops. If you do not know how to tie a dropper loop, then ask the deckhands - it's one of the easiest loops to tie. These loops will then hold the hooks, which are just looped on and not knot tied. Sinkers should be no less than 1 lb. 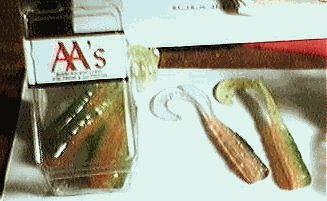 I always used 2 lb sinkers and had no problems with my line sliding to the sides on the drop. The hooks can be of any type. People using live bait hooks did just as good. A sand dab rig. Place your hooks about 2.5 to 3 inches apart. 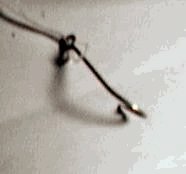 Place one or two beads in between hooks. Some days these beads seem to make a difference. The jury is undecided. You don’t have to knot tie any hooks just loop them as you see here. The loop is just a dropper loop on a 30-50 lb mono-filament. I did notice three things that brought in bigger dabs: Baitmate scent in the saltwater version(blue colored), plastics such as AA's Curly Tails, and squid head/ tentacles part. These three whether all used together brought in larger dabs. You private boaters may find it more convenient and economical to go on the sport boats if fishing alone. The price is only $30-35, including bait. Your own boat's fuel plus launching and bait fees will cost more and you have to drive. One last note, although it's not the prime focus of this section but I cannot stress enough after witnessing it much too often. Please, watch your language when children are present. On my third trip, I saw an old guy next to me just yell out heinous profanities right when there was a little 4-6 year old girl walking by him. She was very frightened with a bewilderd look on her face when the old guy blurted out just because a guy next him[not me] slightly had his line tangled with his just by a hook. I was looking at her pass by when the old guy blurted out his hideous way of communicating his displeasure with what happened. People go fishing to get away from people with attitudes like that old guy in their jobs, etc. and to find some relaxing activity to do. Let's keep it a fun family outting. Pierpoint $30 Wed., Fri. & Sat. only 7am-4pm. (562) 983-9300: Service is good, boat is the smaller of the two. The crowds lately have been smaller on this boat. It's home at Pierpoint Landing is closer to Orange County cities, however, both landings are freeway close from LA county cities. Free parking. Sea Angler $35 slated to fish sand dabs everyday after Jan. 1, 2001. (310) 832-8304, 22nd St. Landing. Usually bigger crowds on this boat and is a larger boat. Service is good. Free parking. 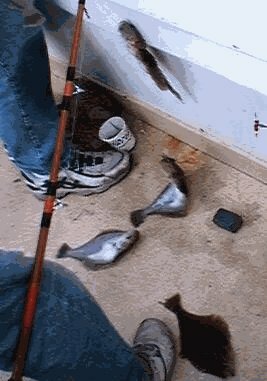 I get my fish cleaned on the boat. The price is a bargain compared to other species. The Sea Angler charges a dime for cleaning each sand dab; the Pierpoint's rate is $5 for every 30 sand dabs. Either boat is quite a bargain. Be sure to tip the deckhands after fish cleaning since they worked hard all the way home for pennies a fish. Sacks full of sand dabs lining up for cleaning. 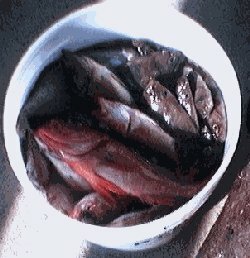 A regular bucket almost filled to the top after a day of solid sand dab fishing. This is an average catch meaning there are catches larger and smaller than this. The starry eye was caught elsewhere at the end when the captain of the Pierpoint tried for salmon groupers. These side trips will not occur when the rock cod closure is mandated. Also, only three hooks are allowed for these rockfish, however, one hook is more effective when fishing for these shallow water salmon groupers. I got one salmon grouper using three hooks but those using one got more. I tried for the other rockfish and got the starry eye- the largest rockfish of the day. Night: The sand dab's excellent table fare is the biggest prize for fishing these fish, not it's repetitive, lack of adrenaline fishing. After you have tried one of these tasty little fishes, you will want more than one like my friends did. The dab's flavor is somewhere with halibut and rockfish. Cooking: Each of my friends cooked them differently but all claim to have eaten very delicious fish. Restaurants consider sand dabs as a delicacy. I agree with all the positive ratings and I rate their taste somewhere up there with halibut and rock cod. The best way I found for cooking sand dabs is the simplest: pan fry them hard with garlic, soy sauce, a pinch of salt & of MSG until their edges are crispy. When pan fried hard to crispy edges the smaller bones of the fish become crispy and brittle, breaking up when chewed and the flavor of the fish is brought out fully. Do not eat the large bones they are still inedible and dangerous. With any fish regardless of how bony one should always consume with caution. Concluding Notes Although sand dabs are not endangered and have no regulatory limits placed on them, I like to see more studies done to find out facts like when they mate, what's their average size when they first spawn. This way, we may prevent them from being a modern day catastrophe like many other species that were over caught. Right now fishing for sand dab is like fishing in the old days, many caught and no limits on size or on quantity. Let's keep this fish from becoming another modern day tragedy. In the mean time, enjoy this fishing because the good old days are here.